I’ve enjoyed working with the Color Efex Pro 4 software this week, and I was inspired to go back into my files. This image was one of those that you take that looks so amazing in real life but then doesn’t really translate through the lens. When I originally worked with it in Lightroom 4, I couldn’t get it to pop, so I set it aside thinking I’d try again. Well, in Color Efex I finally made it happen. 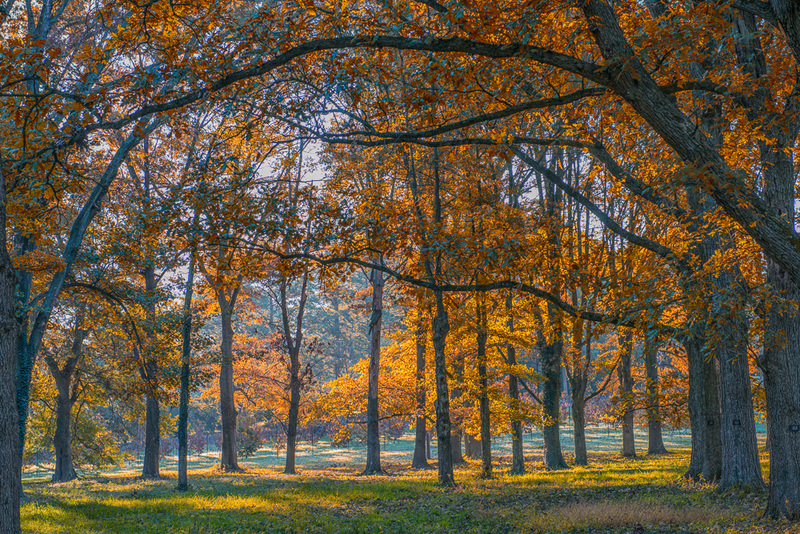 In my mind’s eye, this is the scene I saw at the arboretum on this crisp fall morning. While walking through a dense area of dark evergreens, this colorful oasis came into view. I quickly set up my tripod but could only take a few shots before the magical light vanished. This version may be “too much” for some viewers, but it’s how I want to portray what I saw on this morning, to remember a moment in time that was so quickly here and gone. I edited this using the Detail Extractor, Brilliance/Warmth and Colorize filters and dropped some contact points in to decrease the opacity in the grass and allow the green to show through. Beautiful canopy of tree, and the colors with the shadows. Great job! Thank you! So glad that you like the colors, too! Beautiful woods for this week’s theme!! Gorgeous! Thank you, Cee! I’m certainly enjoying your challenges! WOW ! this is fantastic ! I love the edits that you did with this photo. Now I want color Efex! Thanks, Emily! I am growing to really like this software now that I have a clue at how to use it! Do you happen to use it with Lightroom? There is so much to learn with these digital darkrooms right? Yes, I first edited it slightly in Lightroom–cropped and straightened and then enabled profile corrections. Then pulled it into Color Efex to use the filters. Back in Lightroom I resized and exported. Yes, lots to learn, but it’s fun to continue to expand the brain cells!